Mitsubishi’s Jet Towel hand dryer has had a positive impact, drying hands fast and hygienically since 1992. Mitsubishi’s Jet Towel is the original high-speed hand dryer using dual jets of air to dry users’ hands. The energy efficient operation and sustainable build of the latest Generation 9 models benefits the global environment, reducing CO2 and waste products. Washroom clients enjoy the quiet operation, innovative design and cleanliness of the Jet Towel and its environment. Mitsubishi Electric's proven Dual Jet engineering is now complemented with a streamlined nozzle design that provides an optimum balance between airflow rate and air volume, further enhancing efficiency and drying hands in a matter of seconds. The High-speed Hand Dryer combines a stylish design, convenience, cost-performance, and new wave-shaped nozzles for a satisfyingly quick and quiet user experience. Two models are available: one equipped with a heater for extra comfort and speed; a heater-less model with reduced power consumption. 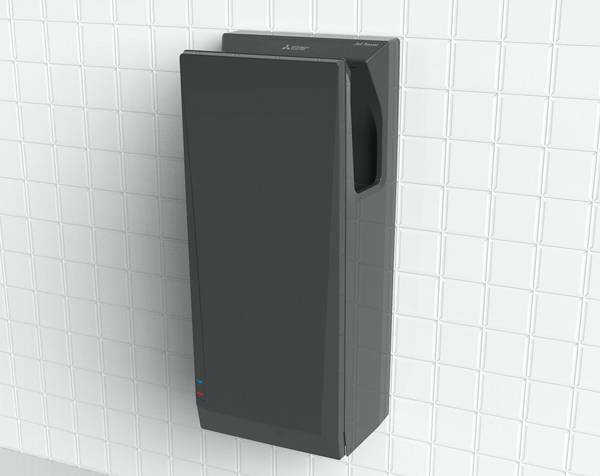 The Jet Towel high performance hand dryer from Mitsubishi Electric has been registered for the government’s Enhanced Capital Allowances (ECAs), therefore will improve cash flow through accelerated tax relief. The ECA Scheme for Energy Saving Technologies encourages businesses to invest in energy-saving plant or machinery specified on the Energy Technology List (ETL), managed by the Carbon Trust on behalf of Government. Only equipment that can prove significant energy advantages is accepted onto the scheme.